This simple and cheap(but powerful) squarewave oscillator can give oscillation to any mosfet based inverter/ups. The circuit consists of one central I.C CD4047. I used HCF4047BE from ST microelectronics. This is an improved version of circuit spread over the internet of inverter by I.C 4047. This circuit is the first part of the Inverter project. This circuit has more efficiency than that one. Here the MOSFET does not gets hot easily, and the Diodes IN4148 provides protection of the circuit in case of MOSFET leakage. A LED is added for easy diagnostics. 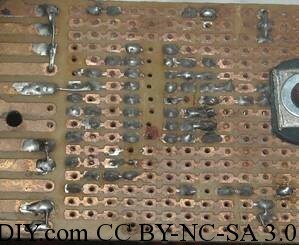 But if you want to make PCB for this, follow my PCB making guide . Total cost is around 20-25 rupees only. Steps to make MOSFET section. i tried to design this circuits but i have replaced 3055 npn transister to N-channel IRF540 Mosfet,i have attached DVM on 220vac output of tranformer,it display only 20 volts,this point to be also noted that 1 mosfet also too hot & 2nd one is normal cool,i have sent the circuit diagram on your gmail add,plz chech it,n tell me how does it work normally. first of all thank you for this circuit and now i need your help. i am new to this field and i am going to design 50 Hz sine wave inverter and for that i need basic ideas so plz will you upload or send me the complete circuit for squarewave inverter. Thanks for the suggestion. The above design is proven to be problem less, but you can do your project with your theory. If that works perfect I hope you’ll share your project details for others help. Actually for a quite long time I considered IN4148 as a zener diode seeing the package. We can consider IN4148 as a zener diode with 75V rating. Thanks for dropping the comment. Dear Arup, you have posted hundreds of circuits here and I have been following your site for a long time now. I am highly surprised to know that you decide on a device by looking at it’s package! So, if you see a small black package with three legs sticking out, you will call it a transistor? Secondly, in my opinion, the two diodes in this circuit are not serving any purpose at all. When the Q pins of the IC goes high, the diodes are forward biased and simply conduct the current into the mosfet gates. In fact, the post by warchen is the correct solution, but even he has forgotten to mention the zener diode voltage. The zener diodes simply help in limiting the output voltage of the IC and produce a better and sharper square wave. 1. I haven’t reached the 100 mark yet. 2. I don’t have any degree in electronics, I learn by 10% reading 40% observing, 40% failing and 10% guessing. 3. Yes, there was a time when I considered all TO-92 devices as transistor until I met the 78L05 regulator. 4. IN4148 has reverse voltage as 75V as per the datasheet and hence a zener breakdown must occur at 75V in reverse bias. 5. Thank you for all of your suggestions back from the FM transmitter article. 6. This article is almost 2years old if you look at the date. I’ve learned many things in these days. I’d appreciate your suggestions in recent articles. I have really enjoyed your answer! Your truthful approach to my post is admirable. 1. I am sorry I failed to notice the date of this article, but then I don’t see articles based on date. I simply click on an article based on it’s topic. 2. The question here is not of the reverse breakdown voltage of 1N4148, the question is what the hell is this diode doing here? Even if we agree that it may act as a zener diode, but how is a 75V zener helping this circuit? The operating voltage around this portion of the circuit is about 12V DC. Moreover, both the diodes are forward biased, so zener action does not arise. I don’t want to be too critical again, but let us be more practical and simplify the circuit by removing redundant components. The least you can do is to change the zener diode symbol into a diode symbol at least. The article may be 2 years old, but your latest post was on 13 March, 2012 (about 17 days ago)but unfortunately you have not had the time to change the diode symbol in 2 years. 3. On a lighter note, I have a brotherly suggestion for your second point above….you shall have to increase the 10% reading to at least 60% reading, observing should not be more than be 25%, Guessing can remain at 10% and failing will automatically come down from a drastic 40% to a mere 5%. If you are interested to know why I have reduced observation from 40% to 25%, you may contact me personally, my email address is with you. Rest assured, I mean good to you and your projects. Thanks for your prompt response. Please Post the MOSFET connections and Transformer Image in the circuit diagram.otherwise it is being very difficult to make this circuit.Thanks in advance! It’s good that you have updated the circuit diagram. Please check that the original smaller version of the circuit is still the same, only the enlarged circuit schematic is updated. If possible, please correct the glitch. Thanks. You can use calculated resistor value, but for accuracy in frequency I’d recommend you to use a DIY USB oscilloscope to analyze the waveform. No substitute for this, however you may find the same IC with different prefix and suffix characters. 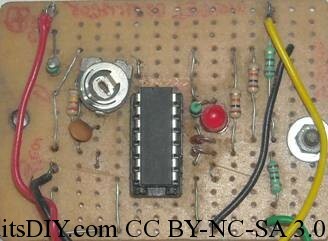 How we can add one battery charging circuit and modify this circuit like an emergency light system.